and corrupt policemen who want to see him go out of business. Watched Harlem Nights again last night and i like it. It´s not a great film but it´s a good film IMO. as well as work with Richard Pryor. Murphy gives a solid performance as Vernest "Quick" Brown. Not his best character but not bad either. Pryor´s role as the club owner Sugar Ray is a bit dull but damn he´s cool! Michael Lerner is excellent as the mob boss Bugsy Calhoune. He sure can play these roles, just sawn him as another mob boss, Arnold Rothstein, in Eight Men Out which came a year earlier. Old timers Redd Foxx and Della Reese are good and Danny Aiello knows how to play dirty cop. Jasmine Guy and especially Lela Rochon are superhot! I also love Arsenio Hall (Coming to America) as crying man. Why this guy didn´t make more movies is beyond me. He started his own tv-show also in ´89 but he should´ve made few more films too. If you still haven´t seen this one, don´t believe the bad reviews and check it out. Just watched it with my family agian and have to say this movie is grossly underated. Good movie all around every character played well, even small parts like Tommy Smalls very good, can't figure out why the film didn't do any better. 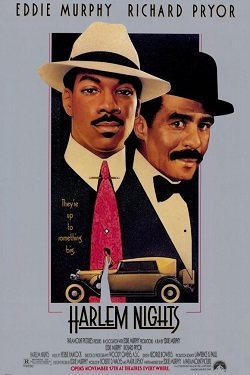 I watched Harlem Nights the other day, and i have to admit it was actually far more enjoyable than i remembered. and comes across very menacing as bad guy mobster boss Bugsy Calhoune trying to move in on Pryor's "candy store". My personal favorite of all the side characters is heavyweight boxing champ Jack Jenkins, who has a speech disorder. and went on to do supporting roles in big-budget Hollywood movies in the 90s, like Cutthroat Island and Snake Eyes. Entertaining, but the combination of comedy and period gangster drama (plus a bit of blaxploitation) is a tough one. 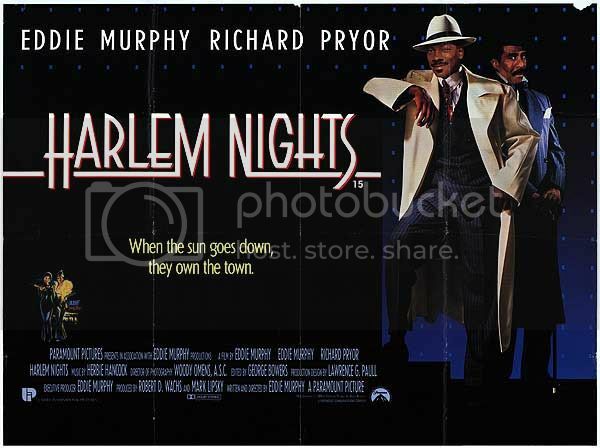 Thanks for the reminder re: Harlem Nights, everyone. I'm not sure if I've seen it in it's entirety, but I believe I've caught bits & pieces over the years. I like period films (i.e., movies that were set at a previous time in history from when they were made), and this looked especially interesting. This thread has inspired me to check out the film so I can finally see it from start to finish. I saw this one again too recently after having not seen in quite a long time. Last viewing before this one was the VHS tape. Unfortunately, I didn't come away enjoying this movie as much this time around. I think perhaps I have just seen it enough times to have my fill of it. I mean this movie is nothing really spectacular to me now after a few viewings. Aside from a few funny scenes and sight gags here an there, there really is nothing else going for this movie. The characters and story are all pretty bland and it's your basic cliche 1930s gangster movie that's been done (much better) a million and one times already in mob movies before it. I also think they tried a little too hard for the 'R' rating as the profanity is a bit overkill in this movie. Overall, I say this is an O.K. movie to check out if you've never seen it. But after a couple viewings, you'll have your fill and needn't watch it ever again.